UP’s largest solar power plant comes live inaugurated by Prime Minister Modi and French President Emmanuel Macron earlier this week. The 75 MW solar power plant was built at a cost of around INR 500 crore by French firm ENGIE, over 380 acres of land. The plant has 1,18,600 solar panels installed and will generate 15.6 crore units of electricity annually, about 1.30 crore units per month. The French president was visiting India to attend the International Solar Alliance (ISA) summit held in New Delhi during the weekend. 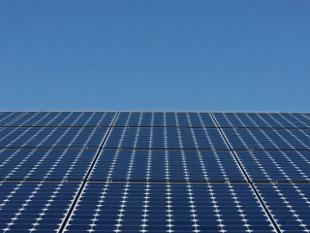 India is amongst the few countries to host some of largest solar power plants installed. It has the highest solar electricity production per watt installed. Some of the other large solar plants in India are – 750MW solar power plant in Rewa district of Madhya Pradesh, Kurnool Ultra Mega Solar Park, Andhra Pradesh, Kamuthi Solar Power Project, Tamil Nadu (648 MW commissioned by Adani Power), Bhadla Solar Park, Rajasthan (2,255 MW), Charanka Solar Park, Gujarat, Sakri Solar Plant, Maharashtra (125 MW) and many more. The Kamuthi Solar Power Project, Tamil Nadu is worth mentioning here. The plant was built in a record time of eight months and is the largest solar plant at a single location. The Kamuthi plant can provide enough electricity to power around 150,000 homes. The 648 MW solar plant consists of 2.5 million solar modules, 576 inverters, and 154 transformers. Not only is India building large solar power plants, the country is also setting records. India’s total installed capacity of solar has nudged across the 20 GW mark last year. India is racing up to rank among the world’s biggest solar market.